enough to go around, with an eye-catching variety of color catering to just about any taste. Heading out to the beach over the weekend? Packing your bags for that annual vacation? Going camping or hitting the park? means you get to enjoy all the fun without getting dragged down by any bulk. - Come in a pack of 12 to give you great bang for your buck. - Beautifully glide through the air for a great game. - Bright colors make them easier to locate on the ground. - Make a great treat for kids of all ages and even adults. - Backed by a 100% money-back guarantee. Click 'Add to Cart' now to make beautiful memories with super fun frisbee discs! SUPER FUN FLYERS: Get the good times off to a flying start with these foldable frisbees for kids! Every set comes with 12 fold-up frisbees ready to inspire hours of active, healthy fun. And they aren't just for kids; even adults will have a blast enjoying some awesome frisbee action. TAKE THEM ANYWHERE: Camping or weekend at the beach, day at the park or out in the yard, these pocket frisbees make every moment incredibly fun. Simply fold away, easily carry the frisbee disc in your pocket or bag, and whip it out to turn up the fun. GREAT VARIETY: We've included an eye-catching variety of color in every frisbee set to suit just about any taste. 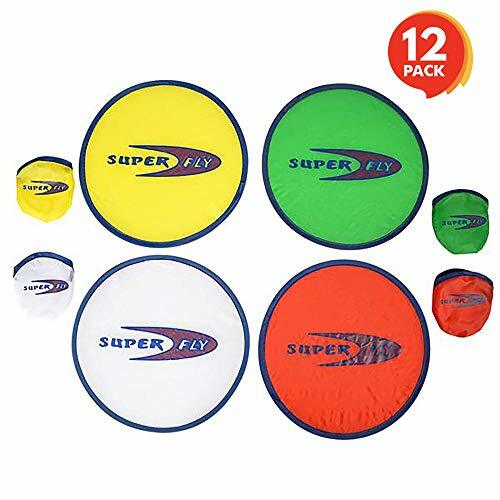 You'll love the beautiful shades of white, yellow, green, and orange that make every frisbee game that much more vibrant and help you easier locate your frisbee. BUY RISK-FREE: We fully stand behind our products with a total satisfaction and 100% money-back guarantee. Not satisfied with the flying discs for kids? We'll send you a quick replacement or issue a full refund. Click 'Add to Cart' now to surprise the kids risk-free!